Dearbhla will lead a strong slow Vinyasa practice focusing on developing strength and flexibility. While moving mindfully through each asana we will hold poses for a little longer to strengthen and also awaken the muscles and open up the whole body. Take some time for you to slow down, reflect, relax and find that inner peace that is always within us. Join Dearbhla for a relaxing, restorative, re-energising practice by candle light. The practice will begin with Yin yoga which aims to stretch and lengthen muscles and open up tired joints, creating a feeling of space and openness within the body. The workshop, led by Dearbhla Glynn, will consist of a strong, slow Vinyasa Yang practice focusing on developing strength, focus, and flexibility. Expect to build fire within and tap in your inner strength while revitalising body and mind. For the second part of the workshop we will move towards a Yin practice where we'll be targeting the connective tissue through long-held passive stretches. We will allow the body to relax into forward folds before closing the session with some calming restorative poses followed by a long savasana. The overall practice will strengthen the body, calm the mind, and encourage deep relaxation. Overall this week is for those of us who want to reconnect with your bodies, calm your mind, finding the strength that is within us and exploring new ways of developing and inspiring our yoga and meditation practice. This retreat is all about slowing down, resting, practicing yoga, meditating and ultimately stepping away from the business of daily life and responsibilities. Taking time to create space, reconnect with yourself, with nature and ultimately just be. Setting intentions can be an important step in creating a focus for the New Year ahead, through our meditation practice and silent walks we will call to mind any intentions you would like to set for the new year and focus on them. Join us for a special retreat as we leave behind that which doesn't serve us and invite more of what we need into the New Year. Dearbhla will lead a strong, slow vinyasa practice, that focuses in particular on opening the joints, lengthening and strengthening the muscles. Expect some lovely strong sequences that will open the hips and the shoulders, deep forward bends. Working towards back bending and chest opening.The focus of this workshop is to feel open and balanced within our body. Expect to build fire within! we will wind down with forward bends and some restorative poses before Savasana. Just before the business of December kicks in, it is a great time to slow down, unwind and relax and restore your energy. 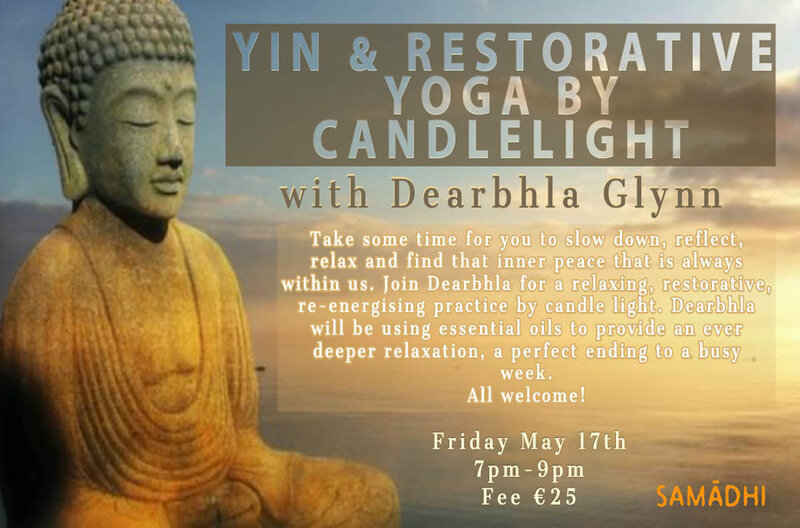 Join Dearbhla for a relaxing, restorative and re-energising practice by candle light. The practice will begin with Yin yoga which aims to stretch and lengthen muscles and open up tired joints, creating a feeling of space and openness within the body. parasympathetic nervous system, calming the mind and relaxing the body. Creating space to let go, rest, restoring our mind, body and spirit. Dearbhla will be using essential oils to provide an ever deeper relaxation, a perfect ending to a busy week! Join me for a special weekend at the Cliff of Moher Yoga Retreat and immerse yourself into the practice of yoga. Embrace nature, get to know your fellow yogis, curl up by our log fires, indulge in our wood-fired hot tub and dine on our amazing organically grown produce. Going upside down is a very rewarding experience, it feels great and it is fun! But if can also be intimidating and challenging. Dearbhla hopes to play around with the throughout the workshop hopes to begin to remove some of these challenges and obstacles that prevent people from going upside down. She will lead a handstand workshop where we will develop some new techniques to approaching handstands. Autumn has arrived it is a great time to slow down, unwind and relax and carve out a little time just for you. Join Dearbhla for a relaxing, restorative, re-energising practice by candle light. The practice will begin with Yin yoga which aims to stretch and lengthen muscles and open up tired joints, creating a feeling of space and openness within the body.